Eye On Sports Media: Forget Hype, Just Get Tiger on Page Two of the Leaderboard! Forget Hype, Just Get Tiger on Page Two of the Leaderboard! We all know that when it comes to professional golf and Tiger Woods, NBC Sports more than cranks up the hype machine, and it is downright tacky. CBS Sports takes a different approach, especially when it comes to The Masters. All week long, the public relations face of CBS Sports focused on the tournament and all of the players in the field. This does not mean that the marketing of Tiger is not addressed on the broadcasts. And this subliminal hype extends to Phil Mickelson as well. You can see this in the leaderboard presentation on the CBS Sports broadcast as compared to the traditional leaderboard presentation, where whoever posts the scores in a group are traditionally listed first. 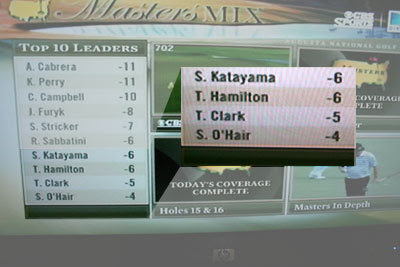 During the broadcast, CBS Sports shows pages one and two of the leaderboard, each page with five players. Tiger Woods was listed in the 10th position, despite the fact that Sean O'Hair had already posted his score of four under (-4). 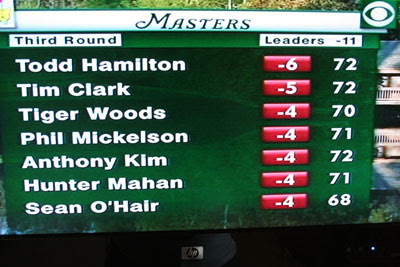 When they went of the air, the leaderboard pages had six players on each page. This allowed CBS Sports to show Tiger and Phil in the 10th and 11th positions visually, even though other players should have been listed higher technically. 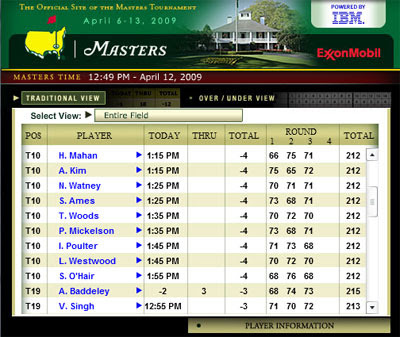 and the official leaderboard of The Masters web site. What does this mean? Very simply, there are subtle ways to hype a product and a final round paiting of Woods and Mickelson that doesn't push the classisness envelope, and does not distort information too much. Are you listening NBC Sports?